A friend who hasn’t used Twitter much asked some pretty basic questions that I thought might make a couple of #twutorial posts. This post will focus on getting started using Twitter. Tomorrow I’ll cover event promotion. I appreciate when people candidly ask for help, so I have edited my friend’s email to protect his identity. He was referred to a couple of specific event, but I have edited the references to make them more generic. I’m afraid I’m one of those who has trouble grasping the concept of Twitter so I wonder if you’d take some time out to deal with challenged folks, such as me. 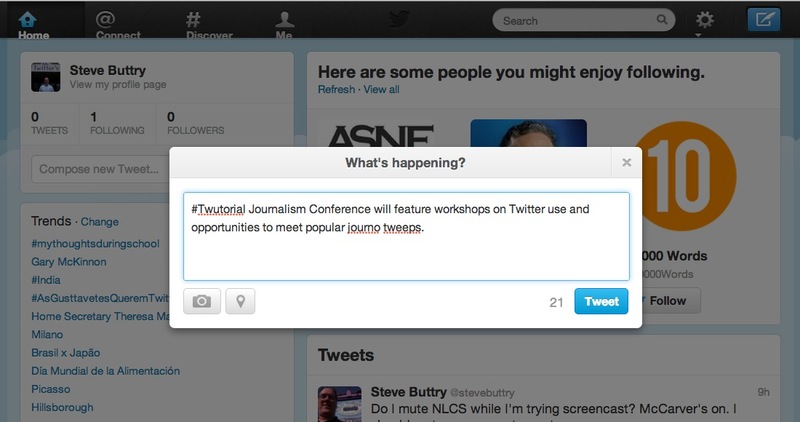 I have a personal twitter account but have contributed very little to it except to promote a journalism conference. Haven’t a clue if it registered with many because my followers number the fingers on my right hand. And maybe a few on my left hand. I do follow a few tweets but infrequently. A couple of baseball players, some about the news biz. But it’s not convenient. I have to be sitting at my desktop and go through the steps to see the activity on my account. By then, I’ve lost interest. So, how do I see tweets in relatively real time? I do not have a smartphone (is that it?). Besides my desktop, I have an android-based tablet (Iconia Acer) based on wifi, an iPod Touch (wifi), and a simple cellphone which I’m not keen about loading up with dataplans to see twitterers. Ergo, I have to work pretty hard at reading tweets. Is that the way it is? So, that’s the basic situation I’m in. Now, I want to set up an account for another event. It is coming to the time when we must start promotion. I think I know how to set up an account but if you could give me a “101” on doing that, I’d appreciate it. Then, how do I let all those editors, reporters, publishers know about my tweets. Do they find me? Do I find them? If so, how? We’re in the process of modernizing the website and it will be equipped for twitter feeds but I’d like to get a head start on it. Excellent questions, all. I’ll start with the Twitter 101, then do a separate post on event promotion. You create an account by going to twitter.com and filling in a unique username (I used buttrytwutorial to set up a demo account for this blog post) and password. You can do this from mobile devices, but I am going to describe how you do it on a desktop computer from any browser. Twitter will ask you to choose five people to follow immediately. I encourage bypassing that step. Don’t follow people until you give them some reason to follow you back. They will probably get a notification that you are following them and they might check you out to see whether they want to follow you back. 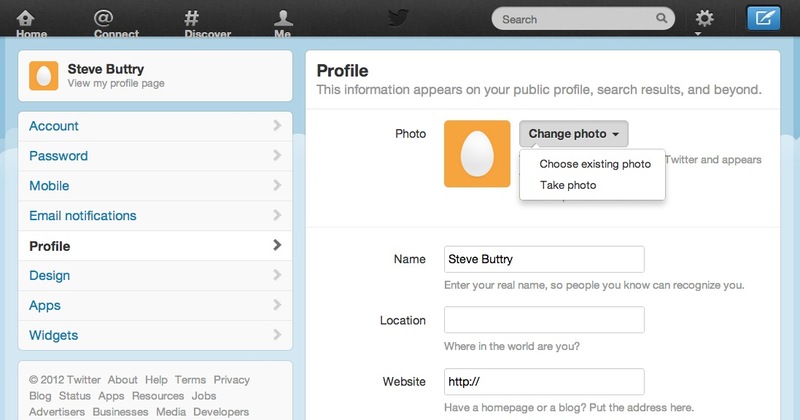 Fill out your profile and tweet a few times before you start following people. You will receive an email asking you to confirm your account, and that will take you to the Twitter home page, which will show the most recent tweets of anyone you did choose to follow. You want to start out at your settings, which you find in a pull-down menu that appears when you click the little arrow under the gear icon at the top right corner, to the right of the search window. Going to settings will take you to Account, which is also the top tab over on the left. The only change I recommend making there is to add location to your settings. But look over the other options and decide whether you want to check or uncheck any default. Don’t check to protect your tweets. Journalists will get little use from a private Twitter account. Be sure to save changes each time you do some work in a tab on the Twitter settings. The save button will be at the bottom. The mobile tab gives you an opportunity to download apps (including some Android Twitter apps that should include one that works on my friend’s tablet). You also can download apps for iPhone or iPad at the app store on your phone or tablet. 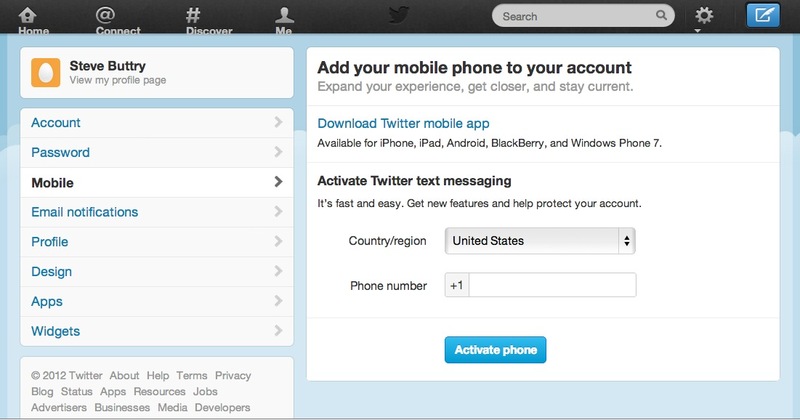 You can activate Twitter by text messaging if you enter your phone number. That will allow you to tweet by sending text messages (to 40404 in the United States, 21212 in Canada and a variety of other numbers, depending on country and carrier). Under the email notifications tab, Twitter defaults to more emails than you probably want to receive. To start, I recommend leaving the top group of boxes checked and unchecking activity from your network and all the updates from Twitter (except possibly the tips). As you get more Twitter activity, you probably will want to uncheck some of the top notifications (I don’t get emails any more about retweets or favorites). To start, though, I certainly recommend getting emails about direct messages and new followers. Those emails will help you follow people with mutual interests and stay active on Twitter. One of the most important tabs to fill out in your settings is the profile. Upload a photo or logo. Nothing marks you as a newbie more clearly than the default egg avatar. Fill in your location and a website link. Write a bio that will help people decide who you are and whether they want to follow you. It’s OK — good, in fact — to show a little personality in your bio, which gets 160 characters. The last choice you face in your profile is whether to post your tweets to Facebook. I don’t recommend that. The design tab lets you customize the appearance of your Twitter account, choosing a different background or uploading a photo for your background. My friend might want to use a background with the logo of the conference or event. You also can choose a photo and background for your header (which people see when they view your Twitter page) and customize other design features. But I recommend starting out with the default designs for most journalists (a visual journalist or designer might want a stellar design from the start). I suggest ignoring the apps and widgets buttons, the bottom two settings tabs. They are for intermediate or advanced Twitter users. 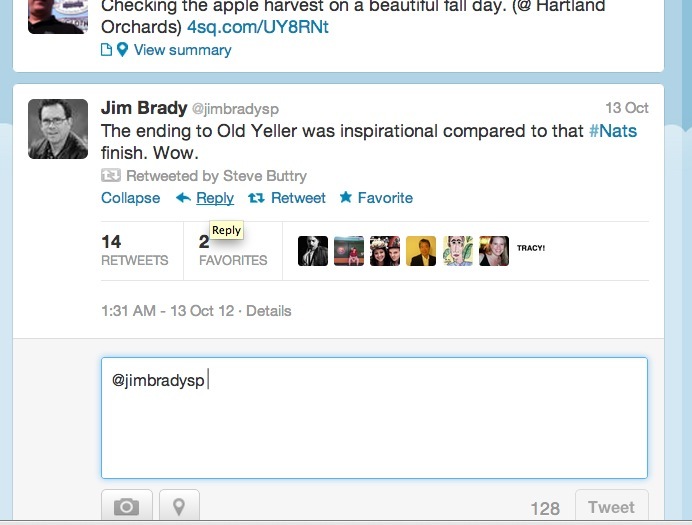 You tweet by clicking the blue box in the upper right corner, with a little quill icon coming out from it (above). That opens a window, like the one below, where you can type a tweet. The number next to the “tweet” button is the number of characters you have left. If you want to tweet a photo, use the camera icon to the left. Once your tweet is finished, you click the tweet button. As I said, you should tweet a few times before you start following people. Chances are that few people will read your early tweets, but they still are important, because they will help the first few people who follow you decide whether you will be worth following. For my friend who’s managing a journalism event, I recommend that the first few tweets provide some general promotional information, as in my tweet above. After you’ve filled out your profile and tweeted a few times, it’s time to find people to follow. Google the name and Twitter (and a keyword or two, if the person has a common name). For many people, the Twitter account will show on the first page of results. It’s the first result for me. On Twitter, click #Discover in the top bar, then click “who to follow” (ignoring the copy editor within that is shouting “whom!”). 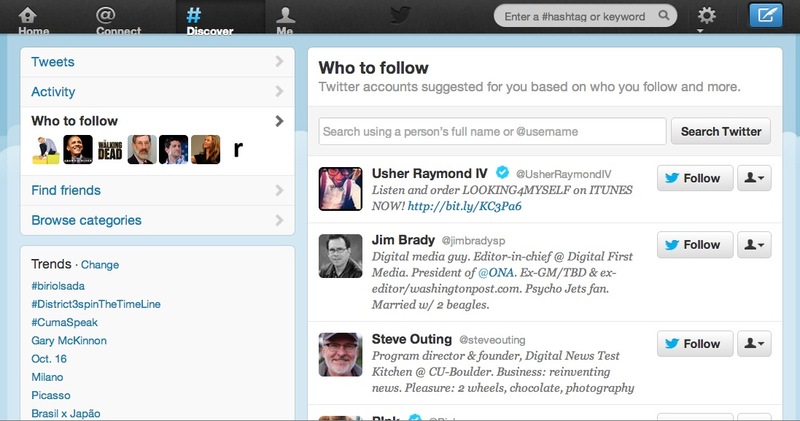 Twitter will recommend some people based on the people you are already following. At this point, my demo account is only following me, but the first suggestion after the promoted celebrity account is Jim Brady, my boss. He is followed by Steve Outing, for whom I’m leading a workshop in Colorado this weekend. Most of the suggestions Twitter is offering for my new account are excellent matches for me. In the search window on the “who to follow” page, fill in a person’s name (and a keyword that might be in his or her bio or tweets), and you probably will find the person pretty easily if he or she is on Twitter and using that name. I wrote a whole #twutorial post on finding good people to follow on Twitter. I find it pretty easy to follow tweets at Twitter.com. Some people prefer TweetDeck or HootSuite, both of which I’ve used and found helpful (but I just love the chaos and serendipity of my unsorted timeline). Several mobile apps are also easy to use. What I recommend to my friend is leaving Twitter.com open on a tab on his browser and downloading a high-rated Android app to his tablet. If that isn’t working for you, especially if you are following enough people that you start feeling overwhelmed, I recommend trying TweetDeck. TweetDeck is also helpful for my friend’s desire to see tweets in real time. TweetDeck pings and shows the new tweets on the bottom right part of your screen as they come in. When you follow as many accounts as I do, that becomes an almost constant stream that I find annoying. But it might be just the right thing to help someone starting out who wants to see tweets in real time. 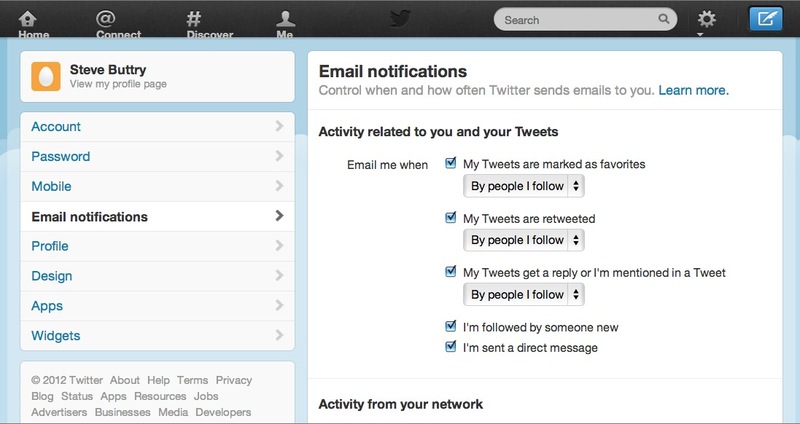 Email notifications of tweets that mention you would be another way to help you see tweets in real time. One of the most important things to do is monitor your “mentions,” which will be tweets where someone uses your @username, either replying to you, retweeting you or talking about you. That’s the “@ connect” tab on the top bar, right next to the home tab. You should reply to people addressing you, thank people for retweets or kind mentions and address questions and criticisms. This screen has tabs for seeing just mentions of you or interactions, such as new followers or people favoriting your tweets. I also recommend using lists and searches as I’ve outlined in a previous #twutorial post on organizing the chaos. If any regular users of TweetDeck or HootSuite would like to write a guest #twutorial piece on either of them, I would be happy to post that here. Or if you’ve already done one, or know of a good one, send me the link and I’ll link to it. You can send direct messages to people on Twitter by choosing “direct messages” from the pulldown menu where you found settings. You can only send direct messages to people who follow you. If you click “reply” on the options that show up when you scroll your cursor over a tweet, and reply to someone in a tweet that starts with @username, that tweet will not appear in anyone’s timeline unless they follow both of you. So it’s semi-private. But if someone goes to your Twitter page, the tweet will appear. Or if you use a hashtag, it will appear when anyone clicks or searches the hashtag. It also will show up in search. To make a reply appear in the timelines of your followers, just type a period in front of the username: .@username. Set a hashtag for your event. If it’s an annual event, the organization’s abbreviation, plus the year usually works (#ona12 was the hashtag for this year’s Online News Association conference). But do a search for the hashtag to make sure someone else isn’t using it. Use the hashtag in all your tweets to encourage others to use it. Hashtags help spread the word. 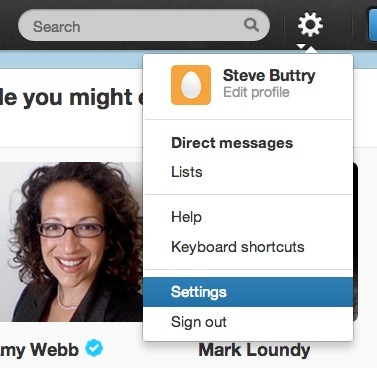 Place a Twitter button prominently on your home page and story pages. Use your Twitter username in your email signature. Mention your new Twitter account and username on your Facebook page. Presuming that you have an email list for the event, emails promoting the event should promote the hashtag and encourage people to follow your new Twitter account. I’ll continue this discussion with another post specifically about promoting an event. What are some other tips you have for my friend and others starting a new Twitter account? Reblogged this on Social Media Marketing for Non-Profits. Reblogged this on Baton Rouge Business Journal.